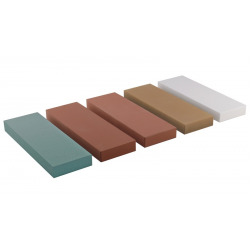 The Naniwa Economical whetstones are great choice on very good price. You get the genuine Naniwa quality on a price tag of an economical stone. They are available at grits 120, 1000, and 3000. Same as for the traditional whetstones, we recommend soaking in water for 15-20 minutes before use. Their measures are 175 (6-7/8”) long x 55 (2-1/8”) wide and 15 (5/8”) mm thickness. This stone is the coarsest one that is used to change the angle of sharpening easily and very quickly, or to sharpen a very worn, wounded and blunted blades. This stone is a popular choice as it perfects the edge of the blade. It is excellent to use after grit stone 120. If your cutting edge is not very dull, you can start sharpening with this grit. This very fine stone is another good choice for properly sharpening. It is precise in polishing. Recommended for use after grit size 120,1000. Economical, Combined Sharpening Naniwa Stones at a Great Price. These stones are produced in grits 120/1000 and 1000/3000. Their dimensions are 175 (6-7 / 8 ") x 55 (2-1 / 8") and 25 (1 ") mm thick. 120/1000 - This stone has two sides - 120 and 1000 grit. Grit 120, gray color, is suitable for fast and rough sharpening of dull edges. On the other side, the grit is 1000, red color, for precise sharpening. After using size 1000, the blade will be finely sharpened. 1000/3000 - This stone has two sides - 1000 and 3000. Grit 1000, red color, is suitable for fine sharpening. Grain 3000, yellow color, is much finer which polishes and perfectly sharpen your knife.